Luxury streetwear brand Off-White has opened a two-level Vancouver flagship which is the brand’s second location in Canada following the opening of a Toronto location about a year ago. The Vancouver store is in a rather unique location, being technically in a laneway between the 1000 blocks of Alberni Street and Robson Street in the heart of the city’s downtown core. Vancouver has recently named some of its laneways and there are plans to upgrade this particular one following a successful pilot in the city. 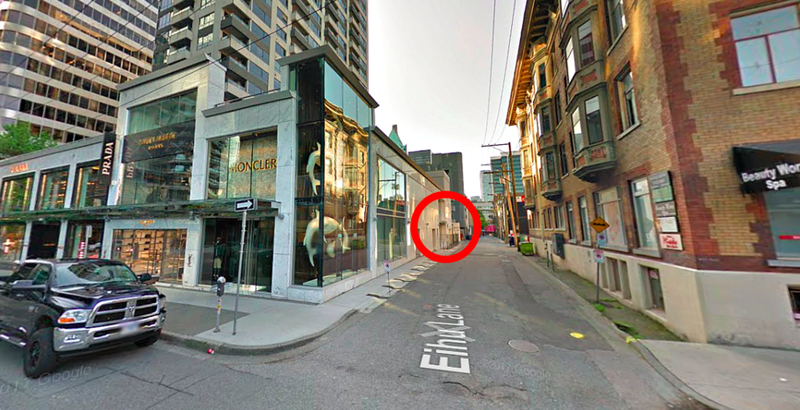 The Vancouver laneway in which Off-White is located has been named Eihu Lane, though the store’s address is technically 101 - 1076 Alberni Street. The new Off-White store spans an impressive 4,300 square feet over two floors. It’s considerably larger than its first North American location which opened in Toronto about a year ago, measuring about 2,400 square feet on one level. A 2,500 square foot location in New York City followed over the summer at 51 Mercer Street in the city’s upscale Soho area. While not confirmed by press time, the Vancouver store could actually be the brand’s largest store globally. Being near wealthy shoppers is key to selecting sites, according to Off-White’s founder and creative director, Virgil Abloh. We sat down with Mr. Abloh for a one-on-one interview at his Toronto store last year, where he described how his brand is inspired by and targets “youth culture”. That would be a wealthy group of cultured youth, however — Off-White’s prices can be astronomical for items that might look considerably less costly, with fashions and accessories that can cost well into the thousands. Retail Insider's Craig Patterson, left, with Virgil Abloh at the opening of Off-White's Toronto store in April of 2017. Luxury pricing will follow Mr. Abloh to French luxury brand Louis Vuitton, where he was recently named artistic director of menswear — his casual designs could revolutionize the future of menswear, to the chagrin of suit-and-tie traditionalists. Mr. Abloh is also the creative director for volatile celebrity Kanye West, who has also been involved with pop-up retail initiatives in Canada such as the ‘Life of Pablo’ pop-up hosted in Toronto in the summer of 2016, which featured stencilled Gilden t-shirts with prices exceeding $100 each. 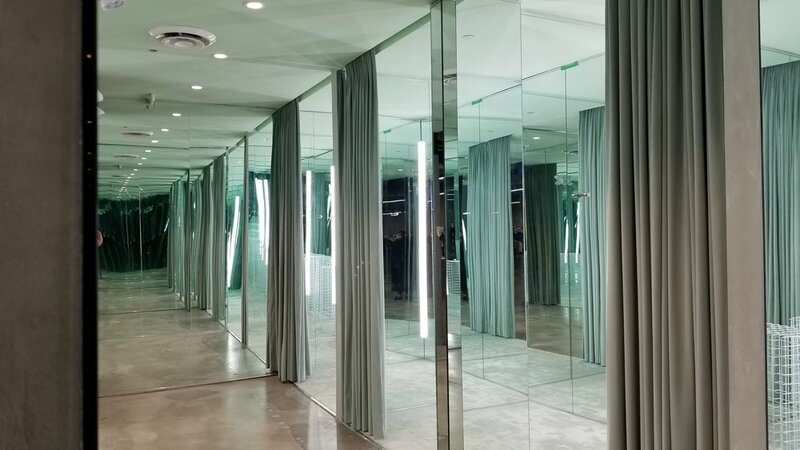 The Vancouver Off-White store is spacious and the design concept was created by Mr. Abloh, and executed by Vancouver-based design firm Cutler. Bare concrete characterizes much of the space from floor-to-ceiling, while trademark mint-green curtains and carpeting can be found in various areas. Golden display units add an air of luxury and other unique design elements include marble slabs from Italy that are held up with dishwasher racks, brushed brass fixtures from Hong Kong, as well as Off-White’s signature striped racks that appear to be inspired by road construction. Similar stripes can also be found on various Off-White designs for both men and women. Off-White’s Vancouver store will be an interactive space that changes, with art installations that will be changed monthly, if not more frequently. Designer Virgil Abloh definitely has an artistic side, also having a background in architecture. One of Off-White’s target demographics is a high-spending Chinese population that both lives in and visits Vancouver. The company notes that the store accepts Chinese payment options such as AliPay and WeChat Pay. We recently reported on how international luxury brands are eyeing Canada, and how they’re evaluating locations based on demographics including Chinese locals and tourists. 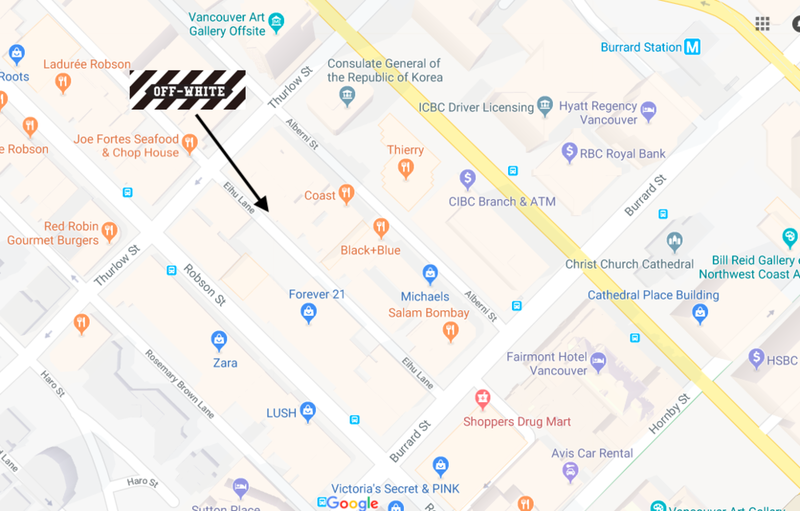 Off-White is located in Vancouver’s burgeoning Alberni Street ‘Luxury Zone’ that has expanded to the area between the Fairmont Hotel Vancouver to the east, and the city’s Trump Tower to the west. Luxury brands including Moncler, Saint Laurent, Prada, De Beers and Hublot are located in the same marble-clad ‘The Carlyle’ complex as Off-White, and many of the world’s leading luxury brands have stores nearby. Virgil Abloh launched Off-White online in 2013 and held its first Paris showroom presentation in January of 2014. In the summer of 2015, Off-White expanded from exclusively menswear into womenswear and remarkably, made it onto the shortlist of the 2015 edition of the LVMH Prize for Young Fashion Designers. The company is owned by Milan-based New Guards Group. 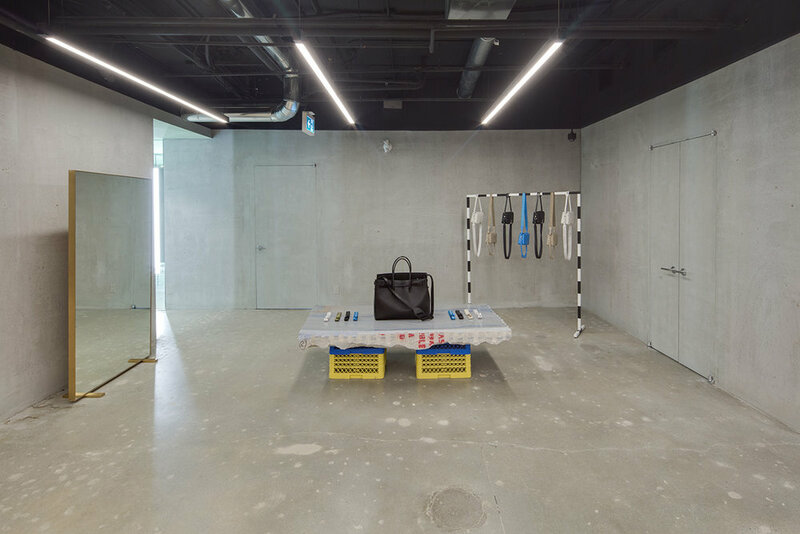 The new Vancouver store features Off-White’s Spring/Summer 2018 collections for men and women, including ready-to-wear, leather goods, accessories and footwear. The Vancouver store has released an exclusive collection titled “MARBLE”, featuring limited edition black and white marble-like graphic prints on short sleeved t-shirts, hoodies and industrial belts. Part of Off-White’s branding includes using “quotations” around words. The word “LAND” is found on the doorway of the Toronto store, and some women’s boots feature the word “WALKING” in quotes — no doubt a nod to the 60’s song by Nancy Sinatra. Off-White’s Spring/Summer 2018 collection is entitled ‘Natural Woman’, and is described as being “a modernized view of the accepted description of Princess Diana as “the People’s Princess” which meant the world is globally processing her impact on the royal family and beyond”. Princess Diana died 20 years ago this year. Mr. Albloh said, “I realized there may be many kids and youth who had no clue of who she was or her impact. Taking from some of her signature, noteworthy looks we updated the closet”. 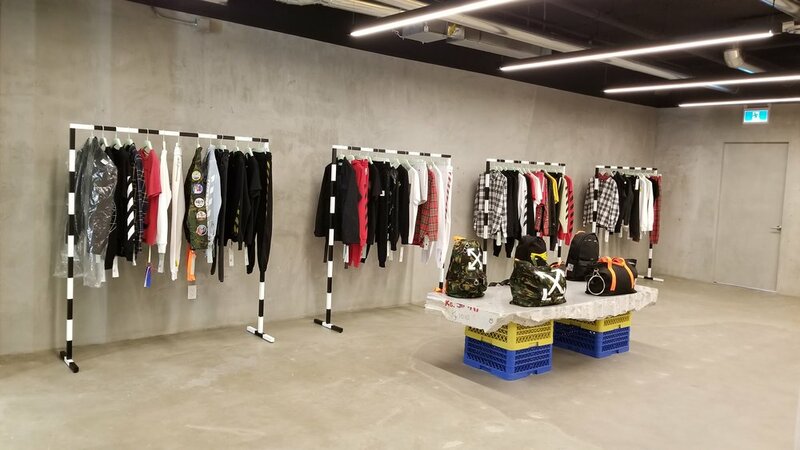 Off-White is expanding its base of stores globally, which includes standalone stores as well as shop-in-store concessions. At press time. Off-White’s website shows that it has 26 locations globally, with many of its stores being in Asia. There are also Off-White stores in Australia, the UK, and Paris, where Mr. Abloh recently moved with his family for his new gig at Louis Vuitton. It remains to be seen if Off-White will open any more Canadian stores, and the collection is carried in Canada in prestigious retailers such as Holt Renfrew, which also carries products from a recent collaboration between Off-White and luxury footwear/accessory brand Jimmy Choo.